Dinner in 30 minutes or less? Yes, please! 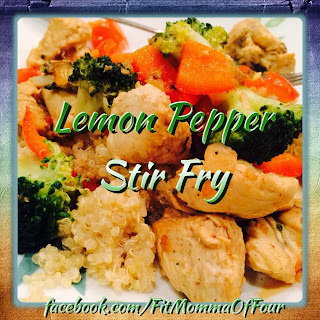 Not only is this recipe quick & easy, it is healthy & delicious clean eating! *This recipe fed my family of 6. -Sauté one small onion in 1 tablespoon of extra-virgin olive oil. - Cut three large chicken breasts into bite-size cubes & add to the pan with onions. Season with sea salt, freshly ground black pepper, and a little bit of garlic powder. Squeeze the juice of one lemon overtop of the chicken. - When the chicken is cooked thoroughly add one head of fresh broccoli and one large red bell pepper that has been chopped. Stir everything together and allow to cook for about 3 to 5 minutes. * As an alternative to rice I served our stirfry on top of quinoa that I cooked with the same seasonings I had put into the stirfry. **I also think this flavor combination with be AMAZING with shrimp. Click here to check out more of my family's favorite clean eating recipes!